Because the Eddie Herr is a Grade 1, not a Grade A, the acceptances come out after those for the Orange Bowl, which is actually a week later. I went over the acceptance lists for the Orange Bowl and the Grade A in Mexico last week; today the Eddie Herr acceptances were published, and in a surprise, the cutoffs are much higher than for those two events, which provide substantially more points. For example, Pan Am Closed finalist Savannah Broadus made the main draw of both Grade As, but because the cutoff for the Eddie Herr is 85, while Orange Bowl's cutoff for girls was 97 and Yucatan 121, she is currently in qualifying at the Eddie Herr. Aside from Broadus, the US girls cohort at the Eddie Herr is very similar to that of the Orange Bowl, with only Caty McNally entered to play in Plantation but not Bradenton. World No. 1 Clara Burel of France, who reached the final last year, losing to Whitney Osuigwe, is on the Eddie Herr entry list, as well as the Yucatan Grade A and the Orange Bowl. The boys cutoff for the Eddie Herr is 103, which is lower than the 109 mark for the Orange Bowl and 126 for Yucatan. This is the same group as in Plantation and Yucatan, with the exception of Cannon Kingsley, who has entered the Orange Bowl. Defending champion Adrian Andreev of Bulgaria is the highest ranking boy entered, at No. 4, one spot ahead of Nakashima. The top American women--Sloane Stephens, Madison Keys, the Williams sisters-- are not playing in the Fed Cup final next month in the Czech Republic, giving Sonya Kenin, Danielle Collins(Virginia), and Nicole Melichar (No. 15 in the world in doubles) the opportunity to represent their country in the competition for the first time. Captain Kathy Rinaldi's team of Collins, Kenin, Melichar and Alison Riske will take the courts in Prague against a formidable Czech team: Petra Kvitova, Karolina Pliskova, Katerina Siniakova and Barbora Strycova. For more on the final, which will be November 10th and 11th, see this article from usta.com. Lisa Stone has a guest post up today at her site Parenting Aces that delves into great detail on the implications of the ITF's new World Tennis Tour being introduced next year. I wrote briefly on this when the USTA announced its new wild card structure last Friday, but this post incorporates a lot more analysis and detail than has been available before today. The focus is on Americans and on the likelihood that collegiate players will be hurt the most by these changes, primarily because they simply can't play as many tournaments as those not in college from February through May. I was told today that the new ITF calendar for the first three months of 2019 has just 41 events, as opposed to 114 in the same time frame this year. There's no question that the ITF's focus on its Top 100 junior rankings as a valid entry criteria for the lower level events is meant to strengthen its own pathway, and there is no evidence they have considered the US college pathway, which has produced two current Top 10 players on the ATP tour, in formulating these changes. So, understanding the challenges ahead is critical for everyone considering playing on the Pro Circuit, and this post goes a long way toward anticipating many of the problems that may arise in the first quarter of 2019. Also of note, a change I missed when reading through the USTA's FAQ last week, is that the qualifying for the ITF tournaments, now fields of 24 rather than the usual 64, will be played with a match tiebreaker in lieu of a third set. Even with the shortened weeks for these events, down from 9 days to 7, I don't see why this is necessary, since there are only two rounds to be played, while before there were (generally) three rounds to be played in three days. The ITA revealed the rest of the fields for next week's National Fall Championships in Surprise Arizona, which begin on Wednesday November 7th. The regional finalists qualified automatically, as did the Masters champions and the quarterfinalists from this month's All-American championships, but now that the fields are 64, not 32 as they were for the Indoor Championships that this tournament replaces, many more at-large bids are available. Brandon Holt of USC and Wake Forest's NCAA champion Petros Chrysochos, a finalist last year, are in the field, but Oliver Crawford of Florida, who won a Futures title earlier this month, and All-American champion JJ Wolf of Ohio State, are not. Duke freshman Maria Mateas, an ITF All-American finalist, is not entered, nor is preseason No. 1 Bianca Turati of Texas, who has been playing Pro Circuit events throughout the fall. The finals will again be streamed on ESPN3 and the ESPN app, with delayed coverage on ESPNU the following week. For more details on that, see this ITA release. The complete selection lists, as well as the schedule for next week is available at the ITA tournament page. Qualifying concluded today at the $80,000 USTA Women's Pro Circuit event in Tyler Texas, the second of the tournaments that will decide the USTA's Australian Open Wild Card. Texan Ellie Douglas, who recently revealed she will be joining TCU in January, won three qualifying matches, all in three sets, with today's 6-3, 6-7(4), 6-4 win coming over former USC star Giuliana Olmos of Mexico. Ann Li defeated former Texas Tech star Gabriela Talaba of Romania 6-2, 6-4 and Quinn Gleason(Notre Dame) qualified with a 6-4, 6-2 win over Vladica Babic(Oklahoma State) of Montenegro. Texas's Bianca Turati, mentioned above, took out top qualifying seed Dalma Galfi of Hungary 6-3, 6-0 to move into the main draw. 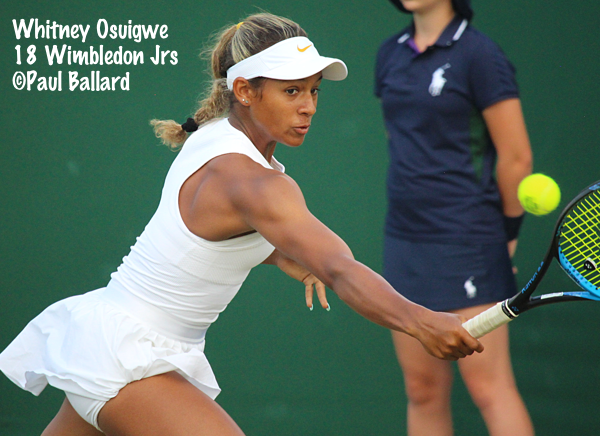 Sixteen-year-old Whitney Osuigwe won her first round match, beating wild card Sophie Chang 6-2, 5-7, 6-3. The leader in the women's USTA Wild Card Challenge is Macon champion Varvara Lepchenko, who is also entered this week in Tyler, although unseeded. Lepchenko will face top seed Belinda Bencic of Switzerland if both win their first round matches Wednesday. Madison Brengle is the No. 2 seed. The men start their three-week Wild Card Challenge this week at the $75,000 ATP Challenger in Charlottesville Virginia. Although other ATP Challenger events (and the Paris Masters) count toward the Challenge, this tournament is likely to be the only one to provide substantial points to an American in need of the wild card. Qualifying ended yesterday, with Marcos Giron(UCLA) the only American to reach the main draw with a win (Tommy Paul and Jared Hiltzik got in as lucky losers). Petros Chrysochos(see above) of Cyprus qualified, beating Paul in the final round, and defeated No. 4 seed Lloyd Harris of South Africa 6-1, 6-3 in the first round today. In other first round action, top seed Bradley Klahn(Stanford) advanced, as did Giron, Bjorn Fratangelo, wild card Thai Kwiatkowski(Virginia) and Paul, who beat No. 7 seed Noah Rubin(Wake Forest) 6-2, 6-1 in a rematch of the 2015 Charlottesville final, which Rubin won in three sets. No. 2 seed Michael Mmoh, who accepted a wild card, will play his first round match Wednesday against Darian King of Barbados. The third USTA Pro Circuit event this week is a $15,000 Futures in Birmingham Alabama, which has drawn a large contingent of international collegians, eight of whom qualified yesterday. Only eight Americans were in the main draw, with two of them wild cards: Cannon Kingsley and Neel Rajesh, both of whom lost their first round matches. Fabrizio Ornago of Italy is the top seed, with Strong Kirchheimer(Northwestern) seeded second. The ITF Junior Masters in China was the main focus last week, with girls champion Clara Burel of France moving into the No. 1 spot in the ITF Junior rankings released today, with former No. 1, US Open girls champion Xiyu Wang of China falling to No. 2. Despite losing in the final to Brandon Nakashima, Taiwan's Chun Hsin Tseng maintains his large lead in the boys rankings, but Nakashima did move up to a career-high of No. 5 with his title. 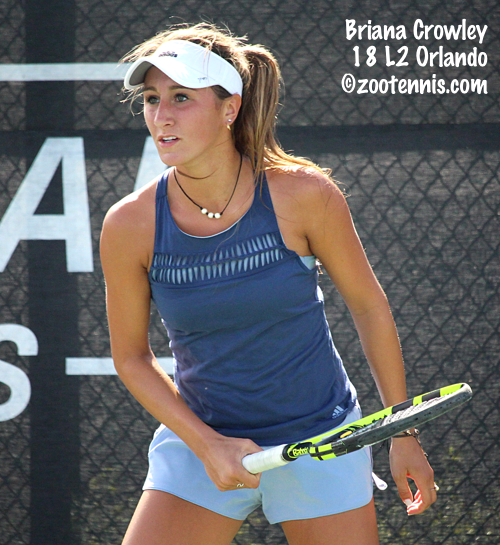 At the ITF Grade 4 in Atlanta, Briana Crowley won her second ITF Junior Circuit title, with the 17-year-old Northwestern recruit, seeded No. 7, beating No. 8 seed Michelle Sorokko 6-4, 6-3 in the final. Crowley was playing her first tournament since the USTA National Team Championships at the end of July. No. 9 seed Keshav Chopra, who turned 17 last week, defeated top seed Andres Martin 6-3, 1-6, 6-3 in the championship match, avenging his loss to Martin in last year's quarterfinals in Atlanta. It's Chopra's first ITF Junior Circuit singles title. Two unseeded teams met in the boys doubles final, with Georgi Mavrodiev and Tyler Stice beating Huntley Allen and Chad Nash 7-6(1), 3-6, 11-9 for the title. The girls doubles final also featured two unseeded teams, with Allie Gretkowski and Anna Ross beating Carly Briggs and Anne Marie Hiser 6-2, 7-5 for the title. At the Grade 5 in Barbados, Daniella Benabraham swept the singles and doubles competitions, with the 14-year-old winning her second ITF Junior Circuit singles title, both since June. Benabraham, the top seed, didn't drop a set in her four victories, beating No. 3 seed Isabella Ciancaglini of Bolivia 6-2, 6-2 in the final. The two singles finalists paired up to win the doubles title, beating No. 3 seeds Hannah Chambers and Chloe Weekes of Barbados 6-1, 7-6(5) in the final. Fifteen-year-old wild card Gabrielius Guzauskas won his first title in just his third ITF Junior Circuit event, taking the boys singles championship with a 6-3, 7-5 win over No. 2 seed Milledge Cossou. Elizabeth Stevens won her second straight doubles title in a Grade 4 in Morocco, again partnering with Julie Belgraver of France. The top seeds took the title when their opponents, No. 3 seeds Oumaima Aziz of Morroco and Luisa Meyer auf der Heide of Germany retired trailing 3-1 in the final. Robin Montgomery, who had a quarterfinal showing at the Grade A in Osaka, continued her impressive form the following week at the Grade 2 in Japan, reaching the final. The unseeded 14-year-old beat three seeds before falling to No. 7 seed Valentina Ryser of Switzerland 6-7(5), 6-4, 6-3 in the final. 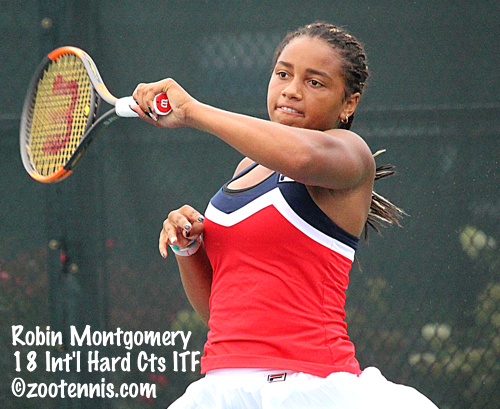 Montgomery is now ranking in the Top 200 of the ITF Junior rankings. The 2017 Junior Orange Bowl 12s champion and 2018 Les Petits As champion Alexandra Eala of the Philippines won her first two ITF Junior Circuit titles last week at the Grade 5 in Spain. The 13-year-old, who has been old enough to compete in ITF Junior events only since late May, had already reached a Grade 4 final in Indonesia this summer. The No. 6 seed in Alicante, Eala defeated top seed Jessica Bouzas Maneiro of Spain 6-2, 6-3 in the final, her fifth consecutive straight-sets win. She and Joelle Steur of Germany, the top seeds, took the doubles title with a 6-2, 6-2 win over unseeded Maria Dzemeshkevich of Russia and Lily Hutchings of Great Britain. Brandon Nakashima played sparingly on the ITF Junior Circuit until this year, but he has risen steadily to the top of the rankings and now has claimed one of the ITF's most prestigious events, the ITF Junior Masters. The Juniors Masters, now in its fourth year, is unique in that only eight girls and eight boys can take part, and it is patterned after the WTA and ATP year-end championships, with top seven players in the ITF Junior rankings, plus one wild card. Not all the top juniors in the rankings accept the invitation; Coco Gauff and Whitney Osuigwe didn't, for example, and Nakashima got in with his ranking of 10, only because Sebastian Korda, Jack Draper of Great Britain and US Open champion Thiago Seyboth Wild of Brazil declined. But Nakashima, who has since fallen to 13 in the junior rankings while playing Futures events post-US Open, went 4-1 against the top juniors at the Masters this week. After two three-set wins and a loss in the round robin stage, the 17-year-old from San Diego really hit his stride in the semifinals and finals; he defeated Adrian Andreev of Bulgaria 7-6(4), 6-3 to reach the final against World No. 1 Chun Hsin Tseng of Taiwan, the French Open and Wimbledon boys champion. From all accounts, (I did not get up at 4 a.m. to watch the livestream) Nakashima played brilliantly in the final, beating Tseng 6-2, 6-1 and will earn $15,000 in travel grants and 750 ranking points, which should move him into the Top 5 in the ITF rankings. For more on the boys final, see this article on the ITF Junior Circuit website. The girls title went to Clara Burel of France, who ended her string of runner-up finishes by beating Maria Camila Osorio Serrano of Colombia 7-6(6), 6-1. Burel, who was a finalist at the Australian Open, US Open and silver medalist at the recent Youth Olympic Games, had beaten Osorio Serrano three times since September including in the round robin stage this week, but she trailed in the first set 5-2 and saved set points before claiming the tiebreaker. With the consistency Burel has shown all year, she is now poised to take over No. 1 spot in the ITF junior rankings, and has entered both the Grade A in Mexico and the Orange Bowl, although withdrawals are always possible this far out. For more on the girls final, see this article from the ITF Junior Circuit website. Americans swept the titles at the $80,000 USTA Women's Pro Circuit tournament in Macon Georgia today. Varvara Lepchenko won her first title in more than seven years, with the 32-year-old left-hander defeating Veronica Cepede Royg of Paraguay 6-4, 6-4 in the final. Lepchenko is the early leader in the USTA's Australian Open Wild Card Challenge. Caty McNally, who turns 17 later this month, won her biggest Pro Circuit doubles title by far today, partnering with Jessica Pegula. The unseeded pair defeated former Florida teammates Ingrid Neel and Kazakhstan's Anna Danilina, also unseeded, 6-1, 5-7, 11-9 in the final. McNally has won four other Pro Circuit doubles titles, with all those at the $15,000 level. At the $60,000 ITF Women's Circuit event in Saguenay Canada, 19-year-old Katherine Sebov took the title, beating Quirine Lemoine of the Netherlands 7-6(10), 7-6(4) in the final between unseeded players. It's Sebov's first Pro Circuit title. Connie Perrin of Switzerland and Tara Moore of Great Britain won the doubles title, with the No. 3 seeds beating unseeded Maria Sanchez(USC) and Canada's Sharon Fichman 6-0, 5-7, 10-7 in the final. At the $50,000+H ATP Challenger in Las Vegas, unseeded Australian Thanasi Kokkinakis defeated unseeded Blaz Rola(Ohio State) of Slovenia 6-4, 6-4 in the singles final. Venzuela's Roberto Maytin(Baylor) and El Salvador's Marcelo Arevalo(Tulsa), the top seeds, won the doubles title, beating No. 4 seeds Nathan Pasha(Georgia) and Robert Galloway(Wofford) 6-3, 6-3 in the final. Former collegians swept the ATP 500 tournament in Vienna, with Kevin Anderson(Illinois) claiming the biggest tournament title of his career with a 6-3, 7-6(3) win over Japan's Kei Nishikori. With the title, Anderson qualified for the year-ending ATP Finals for the first time in his career. Joe Salisbury(Memphis) and Neal Skupski(LSU) of Great Britain won their first title as a team in Vienna, beating Mike Bryan and France's Edouard Roger-Vasselin 7-6(5), 6-3 in the final. It's the second ATP title for both Salisbury and Skupski, with both earning championships with other partners earlier this year. Another former college player, Dom Inglot(Virginia) of Great Britain, won the title at the ATP 500 Swiss Indoor in Basel. Inglot, the 2009 NCAA doubles champion, and Franko Skugor of Croatia won their third ATP title as a team, all this year, with a 6-2, 7-5 decision in the final over Alexander and Mischa Zverev of Germany. Brandon Nakashima earned his first straight-sets victory Saturday at the ITF Junior Masters in China, beating Adrian Andreev of Bulgaria 7-6(4), 6-3 to advance to Sunday's final. 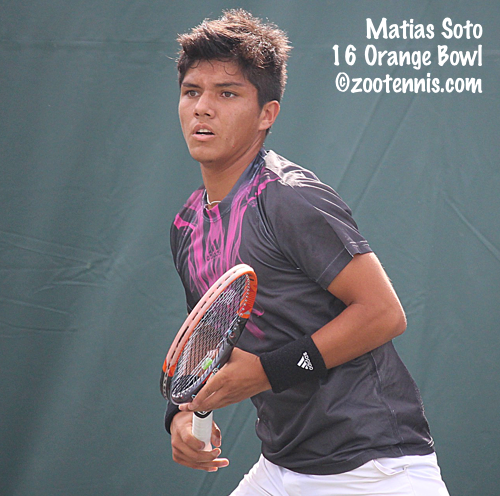 The 17-year-old from San Diego will face two-time junior slam winner and ITF Junior No. 1 Chun Hsin Tseng of Taiwan for the title, after Tseng overcame Youth Olympic Games gold medalist Hugo Gaston of France 4-6, 6-2, 6-3 in the other semifinal. Nakashima and Tseng have not played despite both having competed in the last three junior slams. For more from Nakashima and Tseng, see this article from the ITF Junior Circuit website. The girls final, on the other hand, will feature two players who have already met three times in the past two months. Clara Burel of France defeated Maria Camila Osorio Serrano of Colombia in the semifinals of the US Open Juniors and the semifinals of the Youth Olympic Games earlier this month, before beating her 6-2, 6-2 in the round robin stage of the competition. Burel defeated En-Shuo Liang of Taiwan in today's semifinals, returning to the court up 6-2, 2-1 after a lengthy rain delay. Liang got the break back immediately upon returning to the court Saturday night and led 5-4 in the second set, but Burel broke at love for a 6-5 lead then brought some big serving into the next game to claim the 6-2, 7-5 victory. Osorio Serrano defeated Clara Tauson of Denmark 6-7(6), 6-2, 6-4 to reach her first final at a Grade A or above. For more on the girls semifinals, see this article from the ITF Junior Circuit website. Live scoring is available here. There is a live stream now up as well at the ITF You Tube channel. The order of play is here. 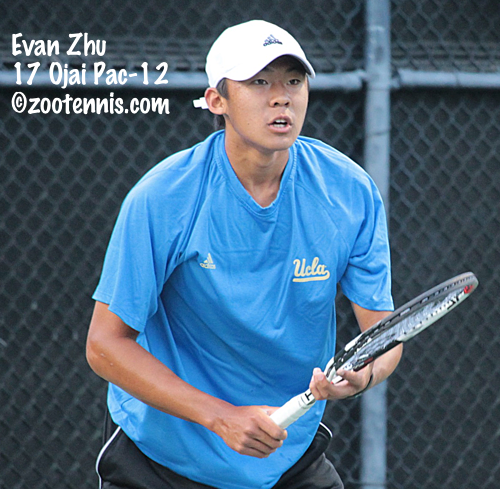 The $25,000 Futures tournament in Waco Texas concluded today, with UCLA junior Evan Zhu claiming his first singles title on the Pro Circuit. The 20-year-old, who won the NCAA doubles title this year with Martin Redlicki, did not drop a set throughout the week, and today had to play only one set, with Baylor sophomore Roy Smith retiring after dropping the first 6-3. In Friday's doubles final, UCLA senior Maxime Cressy of France and former Bruin Nick Meister won their third straight title in the $25,000 Texas Futures. Cressy and Meister, seeded fourth, defeated No. 2 seeds John Paul Fruttero and DJ Thomas 6-1, 6-4 in the final. It's the third time that Fruttero has come out on the losing end in doubles finals this month in Texas, with three different partners. Varvara Lepchenko, who has a career-high WTA ranking of 19, fell out of the Top 100 this summer, and is now ranked 162. The 32-year-old is back on the ITF Women's Circuit for the first time since early last year this week at the $80,000 tournament in Macon Georgia and she will now take the early lead in the USTA's Australian Open Wild Card Challenge after reaching the final with two wins today. Lepchenko defeated Danielle Lao(USC) 6-2, 7-5 in the quarterfinals and Allie Kiick 6-4, 6-2 in the semifinals, with a rainout yesterday pushing the quarterfinals into today. Lepchenko's opponent in the final will be Veronica Cepede Royg of Paraguay, who beat Hailey Baptiste 6-4, 6-4 in the quarterfinals and Marie Bouzkova of the Czech Republic 6-3, 2-0 retired in the semifinals. At the $50,000+H ATP Challenger in Las Vegas, former Ohio State star and 2013 NCAA singles champion Blaz Rola of Slovenia has advanced to the final. Rola defeated Australian JP Smith(Tennessee) 6-3, 7-5 to reach his first Challenger final since April, with tournament press aide Steve Pratt explaining in this article the illness behind Rola's slump. He will face another unseeded Australian, Thanasi Kokkinakis, for the title Sunday. Kokkinakis defeated No. 3 seed Casper Ruud of Norway 6-4, 6-1 in today's semifinal. In Singapore, Sloane Stephens has advanced to the WTA Finals championship match, where she will face Elina Svitolina of Ukraine. Stephens, the No. 5 seed, defeated Karolina Pliskova of the Czech Republic 0-6, 6-4, 6-1 in today's semifinals after going undefeated in her round robin group earlier in the week. For more on today's semifinal matches, see this article from the Associated Press. This is the time of year that many high school seniors will be signing National Letters of Intent for Fall of 2019, but for those attending Ivy League schools, the process is different, with no NLIs. Blue Chip Ronan Jachuck spoke with me earlier this month about the timeline of his recruiting process with Harvard and I put together this Tennis Recruiting Network article about his decision to join the Crimson next fall. The final round of round robin competition has concluded at the ITF Junior Masters, with Brandon Nakashima reaching the semifinals by virtue of a 4-6, 6-3, 6-3 win over Lorenzo Musetti of Italy. Nakashima finished first in his group with a 2-1 record, with his win over Hugo Gaston of France the tiebreaker, with Gaston also winning today. Nakashima will face Adrian Andreev of Bulgaria in the semifinals, while Gaston will face Chun Hsin Tseng of Taiwan, who is the only boy to go 3-0 in the round robin stage. Final round robin standings and Saturday's schedule is here. Live scoring is here. The USTA announced today that they are expanding their wild card structure in 2019 with an eye toward providing American players with more opportunities to navigate the ITF's new World Tennis Tour. These wild card linkages in junior, college and pro tennis are increased and formalized in a way that they have not been before, with the USTA obviously concerned that American players may find it much more difficult to gain entry to the events that actually result in ATP/WTA points. The junior wild cards are greatly expanded and not just for ITF WTT events, but also for other junior events. For example, the Indoor 18s girls champion gets a wild card into the Easter Bowl, the girls 16s Easter Bowl champion gets a wild card into the ITF Grade 1 in College Park, and finishing third in the 16s at Kalamazoo earns an Orange Bowl wild card. After a scare last summer, when former USTA Player Development director and current ESPN announcer Patrick McEnroe said he didn't think the Kalamazoo 18s champion should get a main draw wild card to the US Open, it's reassuring that the USTA 18s champions, both boys and girls, are still slated to receive those precious wild cards in this new system. New tournaments that are open to all Americans--four National Opens and four National Closeds--will earn wild cards into Transition Tour events, and college players will also be able to earn high level wild cards with their performances at the major ITA events. (Interesting to note that the language for the NCAA champion reads that the winner will be "strongly considered" for a US Open main draw wild card and is guaranteed a qualifying wild card, which has never been put in writing before). The one caveat that I see to this, and I can hardly blame the USTA, given how many more wild cards are now in play, is that the player must be proactive in redeeming one of these earned wild cards. "Players who earn a results-based wild card from one of the below mentioned events must submit an email to wildcards@usta.com within two weeks to arrange. The email must contain the players first three tournament choices in order of preference based on the applicable level mentioned. These tournaments must fall within a nine month window from the day a player earns their wild card. The player will then be instructed to complete the request online via the Wild Card Request Form by clicking here. The USTA will make every effort to award the wild card to one of the players’ selected events, but it is not guaranteed. Furthermore, circumstances may arise where a player must submit additional tournament choices." The USTA also has recently released the schedule for men's and women's Pro Circuit events in 2019, which also includes college and junior events. It's imperative that every junior coach and player, every college coach and player and every pro coach and player study these schedules carefully to determine the best path for their development and points accumulation. Kudos to the USTA for taking a proactive approach to this major change by the ITF, but it is not up to them to manage individual players' schedules for maximum impact. Getting to know the 2019 schedule and the incentives offered is important for every American player, whether they are looking to play junior slams, college tennis or Pro Circuit and ATP/WTA events. For more on the USTA's new Competitive Pathway, see this page, with links to all the necessary information. The impact of the ITF changes are not confined to the United States, of course. Stephanie Myles at TennisLife has some disturbing news from Canada on the seven men's Futures there that will not be held in 2019. She also explores the effect it may have on young players who will no longer have these events to boost their rankings. Tseng and Andreev have gone 2-0 in their group, so they will advance to the semifinals regardless of what happens in their head-to-head meeting Friday. Baez, Nakashima, Gaston and Musetti are all 1-1, so the Friday matches will decide who advances to the semifinals, with Nakashima playing Musetti and Gaston facing Baez, with the winners advancing. Tauson is 2-0 and should advance regardless of her result Friday, while Xinyu Wang and En Shuo Liang, both 1-1, meet for the second spot in the semifinals from that group. Live scoring is available here. For complete standings and Friday's schedule, see the ITF Junior Circuit website. After a week off, the fall ITF Junior Circuit in the United States continues this week with a Grade 4 event in Atlanta. The semifinals are set for Friday, and include two wild cards on the girls side. No. 7 seed Briana Crowley will face wild card Ruth Marsh in the top half semifinal, and Katrina Scott will play No. 8 seed (and qualifier) Michelle Sorokko in the bottom half semifinal. Top seed Hina Inoue lost in the third round and No. 2 seed Kailey Evans fell in the second round. Top seed Andres Martin has advanced to the boys semifinals, where he will face unseeded Jeremie Casabon. Qualifier Tyler Stice defeated No. 2 seed Cleeve Harper of Canada 6-2, 0-6, 7-5 in the quarterfinals today for his seventh win since Saturday, and will play No. 9 seed Keshav Chopra for a place in the final. Rain in Waco on Wednesday meant that only doubles were played, indoors, at the $25,000 Futures there, so two rounds of singles were played today. Baylor sophomore Roy Smith posted two big wins today to advance to his first Futures semifinal, with the 20-year-old wild card defeating top seed Ronnie Schneider(UNC) 2-6, 6-1, 6-3 in the second round and UCLA senior Maxime Cressy of France 6-3, 6-2 in the quarterfinals. Another Baylor sophomore, Matias Soto of Chile, also a wild card, defeated Stephan Gerritsen of the Netherlands 6-4, 6-2 and closed out a long day in Waco with a 3-6, 6-1, 7-6(5) win over Georgia recruit Trent Bryde. Former Bear Maxime Tchoutakian of France, who had eliminated another Baylor sophomore, qualifier Kyrylo Tsygura, in the second round, lost to UCLA junior Evan Zhu 6-4, 7-5. Zhu and Soto will face off Friday for a place in the final, while Smith will face qualifier Jonathan Chang(Rice), who defeated No. 3 seed Michael Redlicki in the second round and Jack Findel-Hawkins(North Florida) of Great Britain 4-6, 6-4, 7-6(3) in the quarterfinals. At the $80,000 USTA Women's Pro Circuit tournament in Macon, qualifier Hailey Baptiste has reached the quarterfinals by defeating Ann Li 6-4, 6-4. Baptiste will play Veronica Cepede Royg of Paraguay, one of only two international players remaining in the quarterfinals. The other one, No. 7 seed Marie Bouzkova of the Czech Republic, will face No. 2 seed Jessica Pegula in the quarterfinals. The top half is all unseeded Americans, with Danielle Lao(USC) set to play Varvara Lepchenko and Kayla Day facing Allie Kiick. No Americans remain after the conclusion of the second round of play at the $60,000 ITF Women's Circuit event in Saguenay Canada, but 15-year-old qualifier Dasha Lopatetskaya of Ukraine continues to make news. After defeating No. 4 seed Naomi Broady in the first round, Lopatetskaya ran her Pro Circuit record to 15-0(including qualifying) with a 6-0, 5-7, 6-2 victory over Manon Arcangioli of France. She will play No. 6 seed Jessika Ponchet of France in Friday's quarterfinals. The $50,000+H Challenge in Las Vegas also will not have an American in the quarterfinals, although Jason Jung, the former Michigan star who grew up in California, but now plays for Taiwan, has reached the final eight. Jung, the No. 4 seed, will play former Tennessee All-American JP Smith of Australia. Top seed Lloyd Harris of South Africa lost in the second round to Thanasi Kokkinakis of Australia 6-4, 6-3 yesterday. The final two ITF Grade A events are scheduled for Yucatan Mexico and Plantation Florida, with the ITF Grade 1 Eddie Herr the week between the two. Formerly in Mexico City earlier in the month of November, the Yucatan tournament was elevated to a Grade A from a Grade 1 in previous years. The Orange Bowl, two weeks later, also released its acceptance list earlier today, although it is currently not available on the ITF Junior Circuit website. A few more Americans are entered, and the cutoffs are higher, with 97 for the girls and 109 for the boys. Kylie Collins is the first player out of the main draw at 99. 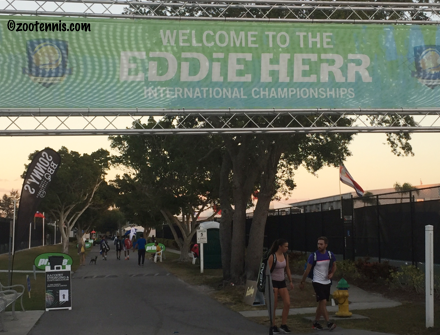 The Eddie Herr Grade 1 acceptances are scheduled to be released next week. The acceptances to the Grade 1 next month in Campeche Mexico are here. No current Top 10 players are entered in Campeche, with main draw ranking cutoffs in the 180-190 range. Today at the ITF Junior Masters in China, Brandon Nakashima defeated Hugo Gaston of France 6-4, 6-7(7), 6-3 in the opening match of the round robin stage of the event. Nakashima will play Sebastian Baez of Argentina on the second day of round robin play Thursday. Nakashima discusses his win over the Youth Olympic gold medalist in this article from the ITF Junior Circuit website. Live scoring is available here. Several of the top American junior girls have elected to concentrate on the ITF Women's Pro Circuit, particularly this fall. Today at the $80,000 tournament in Macon, qualifier Hailey Baptiste, Whitney Osuigwe and Ann Li all advanced to the second round with impressive wins. Baptiste, who turns 17 next month, defeated Asia Muhammad 1-6, 6-3, 6-1 and will face Li in Thursday's second round. Li beat No. 5 seed Nicole Gibbs 2-6, 7-5, 6-0. Osuigwe took out No. 8 seed Christina McHale 7-5, 6-0 and will play another veteran, Varvara Lepchenko, in the second round. No. 4 seed Claire Liu lost to Kayla Day 7-6(7), 6-4, just the second time in five meetings that Day has beaten her younger Southern California rival. Former USC star Danielle Lao took out top seed Madison Brengle 6-3, 6-3 in the first round Tuesday. The last of the ITA Division I Regionals ended today, with an impressive number of the finals contested by teammates. All singles finalists have qualified for the Oracle ITA National Fall Championships next month in Arizona. The complete list of singles and doubles finals results is below, with those at the top of the two lists having been decided last week. D: Christian Sigsgaard and Harrison Scott(Texas) def. Bjorn Thomson and Parker Wynn(Texas Tech) 6-4, 5-7, 11-9. The ITF Junior Masters begins in China Wednesday, with the only American competitor, Brandon Nakashima, taking on Youth Olympic gold medalist Hugo Gaston of France in the first round robin match. 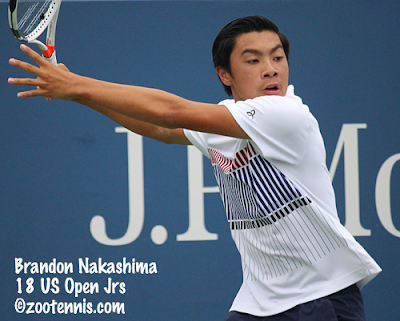 Nakashima defeated Gaston 6-1, 6-2 in the round of 16 at last month's US Open Junior Championships. Because the rankings from October 22nd were used, Xiyu Wang and Xinyu Wang of China were put in separate round robin groups, as they were No. 1 and No. 2 at that date. As of yesterday, Xinyu is down to No. 8, and Xiyu's group includes current ITF No. 2 Clara Burel, who was the silver medalist at the Youth Olympics. The order of play for Wednesday is here; live scores are available here. After a week with just two $25,000 tournaments, the USTA Pro Circuit returns to more significant competition this week, particularly for the women. Their $80,000 tournament in Macon Georgia is the first event in the USTA's Australian Open Wild Card Challenge, and that has led to a American-dominated field, with 18 US women, including six of the eight seeds. Madison Brengle and Jessica Pegula are the top two seeds, with Claire Liu, Kristie Ahn(Stanford), Nicole Gibbs(Stanford), and wild card Christina McHale also seeded. There is a chance the number of Americans could swell to 22, and 20 is guaranteed, with six US women advancing to the final round of qualifying. Sixteen-year-old Hailey Baptiste will face Hanna Chang and Sanaz Marand(UNC) will play Joelle Kissell in all-American final round qualifying matches, while Louisa Chirico and Julia Elbaba(Virginia) face off against international opponents. In addition to McHale, the only other wild card went to former Alabama star Alexa Guarachi of Chile. This is the first tournament in a four-week stretch that will decide the Australian Open reciprocal wild card. The next three tournaments are in Tyler Texas, Las Vegas Nevada, and Houston Texas, with the best three results determining the wild card. The Oracle-sponsored event in Houston is part of the WTA's 125 series, while the other three are $80,000 tournaments. Although not a part of the Wild Card Challenge, $60,000 ITF Women's Circuit tournament in Quebec is on this week's schedule, and it also draws a cohort of Americans. Nine US women are in the main draw, including three who qualified today: Hayley Carter(UNC), Kennedy Shaffer(Georgia) and Jessica Ho(Duke). Carter and Ho will face each other in the first round, while Shaffer plays Amra Sadikovic of Switzerland. The fourth qualifier is 15-year-old Dasha Lopatetskaya of Ukraine, who reached the semifinals of the US Open Junior Championships last month. Lopatetskaya, who won two $15,000 ITF Women's Circuit tournaments this summer and has yet to lose a match on the Pro Circuit, didn't drop a set in her three qualifying wins. She faces No. 4 seed Naomi Broady of Great Britain in the first round of the main draw. The top seed is Kateryna Kozlova of Ukraine, with Conny Perrin of Switzerland the No. 2 seed. After a week when the only ATP Challenger in North America was in Canada, Challenger competition return to the United States with a $50,000+H tournament in Las Vegas. Two Americans qualified for the main draw today, with 2017 NCAA champion Thai Kwiatkowski, the No. 8 seed, defeating top seed Jelle Sells of the Netherlands 6-4, 7-6(6), and No. 4 seed Tommy Paul beating No. 6 seed Alex Sarkissian(Pepperdine) 6-3, 6-3. Evan King lost in the final round of qualifying, but earned entry as a lucky loser, as did Sarkissian. Main draw play also began today, with wild card JJ Wolf(Ohio State) falling to No. 2 seed Adrian Menendez-Maceiras of Spain 6-3, 6-3, and No. 5 seed Noah Rubin eliminated by 2013 NCAA champion Blaz Rola of Slovenia 6-3, 1-6, 6-3. Lloyd Harris of South Africa is the top seed. The men's USTA Australian Open Wild Card Challenge doesn't begin until next week and will span just three weeks, but it includes tournaments outside the United States. The Futures Circuit in Texas moves to Waco this week, with a $25,000 tournament there. Qualifying concluded today, with Baylor sophomore Kyrylo Tsygura, 15-year-old Zachary Svajda and former Rice standout Jonathan Chang earning spots in the main draw. Top seed Ronnie Schneider(UNC) won his first round match today against Aron Hiltzik(Illinois) 6-3, 6-4, but No. 2 seed Sebastian Korda, the 2018 Australian Open boys champion, lost to Georgia recruit Trent Bryde 1-6, 6-3, 6-4. Korda, 18, has won only one match on the Pro Circuit since beating Dennis Novikov in the first round of the US Open men's qualifying in August. Other American seeds losing today were No. 6 Jordi Arconada(Texas A&M), No. 7 Henry Craig(Denver) and No. 8 DJ Thomas. Nineteen-year-old wild card Oliver Crawford won his first Pro Circuit title today at the $25,000 Futures in Harlingen Texas. The University of Florida sophomore, who lost only one set all week, defeated qualifier Andrew Watson of Great Britain, a recent University of Memphis graduate, 6-1, 6-1 in the final, needing only an hour and 11 minutes to secure the title. Crawford, who had never advanced beyond the quarterfinals of a Futures before, will move into the 700s in the ATP rankings with the win, and, importantly, has secured ATP points that will help him gain entry into the new ITF World Tennis Tour next year. Eighteen-year-old Bianca Andreescu of Canada won the the $25,000 USTA Women's Pro Circuit event in Florence South Carolina, with the No. 3 seed defeating unseeded Mari Osaka of Japan 6-4, 2-6, 6-3 in the final. The ITF Grade A Osaka Mayor's Cup concluded today in Japan with top seed Clara Tauson of Denmark and unseeded Keisuke Saitoh of Japan taking the titles. Tauson, who won her quarterfinal and semifinal matches without dropping a game and lost only eight games all week, defeated No. 2 seed Qinwen Zheng of China 6-1, 6-0 in the final for her first Grade A final. The 17-year-old Saitoh, 264 in the ITF Junior rankings coming into the tournament, beat top seed Valentin Royer of France 5-7, 6-1, 6-2 in the semifinals and No. 2 seed Bu Yunchaokete of China 7-5, 6-0 in the final. Japan swept the doubles titles, with unseeded Tomoya Ikeda and Shunsuke Mitsui beating unseeded Tomoya Fujiwara and Taiyo Yamanaka, also of Japan, 6-1, 7-5 in the boys final. No. 7 seeds Mana Kawamura and Funa Kozaki defeated top seed seeds Zheng and Himari Sato of Japan 7-6(3), 6-4 in the girls final. American juniors won ITF Junior Circuit singles titles on three continents this weekend. At the Grade 4 in Brazil, No. 5 seed Dali Blanch defeated fellow 15-year-old and top seed Pedro Boscardin Dias of Brazil 3-6, 7-5, 7-5 in the final. It's the second ITF Junior Circuit title for Blanch, both coming in the past two months. At the ITF Grade 4 in Denmark, 14-year-old Katja Wiersholm won her third singles title since July. The No. 8 seed defeated No. 6 seed Agnes Gustafsson of France 6-3, 6-2 in the singles final, while also reaching the doubles final with Elinor Storkaas of Norway. The Grade 5 in Bermuda produced four titles for American juniors. Fourteen-year-old Rebecca Lynn, who reached the final last week at the Grade 5 in the Dominican Republic, won her first ITF Junior Circuit title with a 6-0, 6-3 victory over top seed Nicole Kiefer. Kiefer and Shirley Liang of Canada won the doubles title, with the top seeds defeating No. 2 seeds Kyra Foster and Canada's Petra Miszczak 3-6, 6-2, 10-7. Seventeen-year-old Jeffrey Fradkin, the No. 2 seed, swept the boys titles, winning his first ITF Junior Circuit singles title with a 6-1, 6-3 victory over No. 3 seed Christopher Heck of Canada. In the doubles, Spencer Brachman and Fradkin, the top seeds, beat Matthew Doe of Great Britain and Richard Mallory of Bermuda 6-4, 6-4 in the final. Three other US junior girls won doubles titles. At the Grade 5 in Kuwait, Lauren Cooper, playing with France's Brigitte Manceau, took the girls doubles championship. The unseeded pair beat top seed Oceane Babel of France and Elena Karner of Austria 7-6(6), 6-3 in the final. At the Grade 5 in British Columbia, Jenna De Falco partnered with Canada's Leena Bennetto for the girls doubles championship. The top seeds defeated No. 4 seeds Alexandra Nielsen and Chae Eun Yoo of Canada 6-3, 3-6, 12-10 in the final. At the Grade 4 in Morocco, Elizabeth Stevens partnered with Julie Belgraver of France for the girls doubles title, with the top seeds beating No. 2 seeds Oumaima Aziz of Morocco and Luisa Meyer Auf der Heide of Germany 1-4, 4-2, 10-6 in the final. Weather obviously was an issue there, with 11 matches played on the final day. 2011 NCAA doubles champion Austin Krajicek won his first ATP doubles title today at the Kremlin Cup in Moscow. The former Texas A&M star, now 28-years-old, partnered with Rajeev Ram(Illinois) to defeat defending champions Max Mirnyi of Belarus and Philipp Oswald of Austria 7-6(4), 6-4 in the final. Krajicek, who had reached two ATP finals earlier this year with Jackson Withrow(Texas A&M) and Jeevan Nedunchezhiyan(Washington), is now at a career-high of 44 in the ATP doubles rankings. For more on today's final, see the ATP website. Nathan Pasha(Georgia) won his first doubles title at the ATP Challenger level yesterday at the $75,000+H tournament in Calgary Canada. The second seeds, Pasha and Wofford graduate Robert Galloway, who now has four Challenger titles this year, defeated top seeds JP Smith(Tennessee) and Matt Reid of Australia 6-4, 4-6, 10-6 in the final. No. 2 seed Ivo Karlovic of Croatia won the singles title, beating top seed Jordan Thompson of Australia 7-6(3), 6-3. University of Florida sophomore Oliver Crawford advanced to the first Futures final Saturday, beating recent Texas A&M graduate Jordi Arconada 6-4, 6-0 at the $25,000 USTA Pro Circuit tournament in Harlingen Texas. The 19-year-old wild card will play qualifier Andrew Watson of Great Britain, who upset top seed Denis Yevseyev of Kazakhstan 6-4, 4-6, 6-4. The 22-year-old Watson, a recent University of Memphis graduate, will be playing in his second career Futures final, having lost to British teen Jack Draper last month in a $15,000 tournament in England. The doubles title went to UCLA senior Maxime Cressy of France and former Bruin Nick Meister, with the No. 3 seeds defeating No. 2 seeds Ronnie Schneider(UNC) and John-Paul Fruttero(Cal) 6-4, 6-2 in the final. Cressy and Meister, who now have won back-to-back titles in $25,000 Futures in Texas, didn't come close to losing a set this week. Both American teenagers fell in the semifinals of the $25,000 women's tournament in Florence South Carolina. No. 8 seed Maria Mateas, the Duke freshman, lost to No. 3 seed Bianca Andreescu of Canada 6-1, 6-2. Qualifier Katie Volynets, who won six matches this week, was beaten by unseeded Mari Osaka of Japan 6-2, 4-6, 6-3. Former Florida star Anna Danilina of Kazakhstan won the doubles title in Florence, partnering with Ulrikke Eikeri of Norway. The No. 2 seeds defeated No. 4 seeds Tara Moore of Great Britain and Conny Perrin of Switzerland 6-7(9), 6-2, 10-8 in the final. It's Danilina's third Pro Circuit doubles title of the year and the eighth of her career. Jeff Biall (Northern), Violet Clark (Midwest), Liezel Huber (Eastern-Elite Athlete), Chuck Gill (Florida), Eleni Rossides (Mid-Atlantic), Neha Uberoi (Eastern-Elite Athlete), Brian Vahaly (Mid-Atlantic), Sam Warburg (Northern California-Elite Athlete), Kurt Zumwalt (Pacific Northwest). The two-year terms begin on January 1st. “I decided it made sense for somebody in the area to own it and to be a steward,” Navarro said. “The timing was right when the opportunity came along. I’m excited for our junior programs, for combining them in a way that makes sense for (the Family Circle program) as well as ours at LTP. I also want to have a program for young aspiring pros who are coming up through the ranks." Last week's ITF Grade B1 Pan American Closed in Charlotte North Carolina encountered one problem after another, including rain on four of the tournament's six days, but the singles did get played, and I recount the first Grade 1 titles for Elli Mandlik and Govind Nanda in this article for the Tennis Recruiting Network. Videos of the two champions are below. It's the first time I've ever taken videos of a final when there was no chair umpire to call the score, so I apologize if it's not clear who won the points. One of the advantages of the courts at the University of Tulsa, where this tournament took place for many years, is the ability to sit behind the courts and get the overall sense of a point. That is not possible here, or at most other tournaments I attend. For the videos of finalists Savannah Broadus and Eliot Spizzirri, click on their names to go to the TennisKalamazoo YouTube channel. Wimbledon announced today that it will be eliminating the advantage set in 2019, with a tiebreaker at 12-12 ending all final sets. This includes both the singles and doubles in the Junior Championships, as well as men's and women's singles and doubles and the mixed doubles. Although junior matches beyond 12-12 in the third set are rare, they do happen occasionally, with one such match in last year's boys semifinal, which ended with Jack Draper of Great Britain beating Nicolas Mejia of Colombia 7-6(5), 6-7(6), 19-17. The Australian Open and French Open have been using third set tiebreakers for juniors for some time, but the men and women still play out the final set until someone has a two-game advantage. 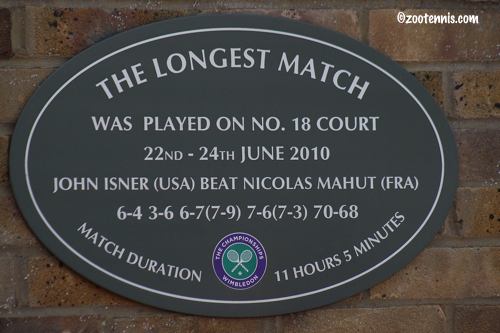 It isn't known if those tournaments will change to a tiebreaker in 2019 now that Wimbledon has. At the ITF Grade A in Osaka Japan, Robin Montgomery lost 6-0, 6-0 to top seed Clara Tauson, leaving no Americans remaining in either singles or doubles draws. Tauson will face No. 9 seed Sohyun Park of Korea, while No. 2 seed Qinwen Zheng of China will play No. 7 seed Daria Snigur of Ukraine. Three of the top four seeds have reached the boys semifinals, with No. 1 Valentin Royer of France playing unseeded Keisuke Saitoh of Japan and No. 2 seed Bu Yunchaokete of China taking on No. 4 seed Gauthier Onclin of Belgium. Four Americans have advanced to the semifinals of the two USTA Pro Circuit events this week, with three of them teenagers. Sixteen-year-old qualifier Katie Volynets, who has just been playing Pro Circuit tournaments and has no WTA ranking, defeated No. 6 seed Sherazad Reix of France 4-6, 7-5, 6-1 in exactly three hours to advance to the semifinals of the $25,000 Women's Pro Circuit tournament in Florence South Carolina. Volynets will face unseeded Mari Osaka of Japan on Saturday. Duke freshman Maria Mateas, the No. 8 seed, defeated No. 2 seed Francoise Abanda 6-3, 4-6, 6-2 and will face another Canadian, No. 3 seed Bianca Andreescu, in the semifinals. At the $25,000 Futures in Harlingen Texas, an American finalist is guaranteed, with Florida sophomore Oliver Crawford, 19, taking on recent Texas A&M grad Jordi Arconada in Saturday's semifinals. Arconada beat former teammate and Aggie sophomore Juan Carlos Aguilar of Bolivia 6-2, 6-4, while wild card Crawford outlasted qualifier Maxime Cressy of France, a UCLA senior, 6-4, 1-6, 6-3. It's Arconada's fifth Futures semifinal since finishing up at Texas A&M in May; Crawford will be playing in the first Futures semifinal of his career. The other semifinal will feature top seed Denis Yevseyev of Kazakhstan against qualifier and recent Memphis standout Andrew Watson of Great Britain. Fourteen-year-old Robin Montgomery advanced to the quarterfinals of the ITF Grade A Osaka Mayor's Cup, beating No. 10 seed Diana Shnaider of Russia 6-4, 6-1. In the second round, Montgomery had defeated No. 6 seed Mananchaya Sawangkaew of Thailand 6-2, 6-7(4), 6-3. She faces top seed Clara Tauson of Denmark next. Montgomery is the only American remaining in singles or doubles, with No. 3 seed Gabby Price losing in the second round. No. 12 seed Zane Khan lost in the third round, to unseeded Keisuke Saitoh of Japan, 6-1, 3-6, 6-3. Khan and Price were the only Americans in the field who were not part of the Junior Tennis Champions Center. It turns out that the College Park Maryland Academy went to Japan early to participate in the International Club Junior Challenge Worldwide Finals, a competition between Academies representing individual countries. The JTCC team of Montgomery, Ayana Akil, Trinity Grear and Muhammad Dossani won the overall title, beating teams from Japan, India, Italy, South Africa and Uruguay. Their success continued this week in Osaka, with Akil, Grear and Dossani qualifying and Akil and Dossani both winning two main draw matches. For more on the JTCC's title, including photos, see this article. Next week's ITF Junior Masters in China has only one American participating, Brandon Nakashima. The ITF Junior Circuit website has been posting features about each of the eight boys and eight girls participating, with today's article about Nakashima. For articles on other players, click on the links below (eight have not yet been featured). Sixteen-year-old qualifier Katie Volynets and University of Florida sophomore Oliver Crawford are among the Americans advancing to the quarterfinals of the two USTA Pro Circuit events this week. Volynets defeated wild card Emina Bektas (Michigan) 6-2, 6-3 today at the $25,000 tournament in Florence South Carolina to advance to her first Pro Circuit quarterfinal. She will play No. 6 seed Sherazad Reix of France on Friday. Other Americans advancing to the quarterfinals are Robin Anderson(UCLA) and Duke freshman Maria Mateas. Anderson defeated qualifier Hanna Chang 7-6(4), 6-3 and Mateas defeated University of Texas junior Bianca Turati of Italy 6-4, 6-4. Both will play seeded Canadians next, with Anderson taking on No. 3 Bianca Andreescu and Mateas facing No. 2 Francoise Abanda. At the $25,000 Futures in Harlingen Texas, wild card Crawford defeated No. 2 seed Ronnie Schneider(UNC) 6-3, 6-3 to reach his second career Futures quarterfinal. 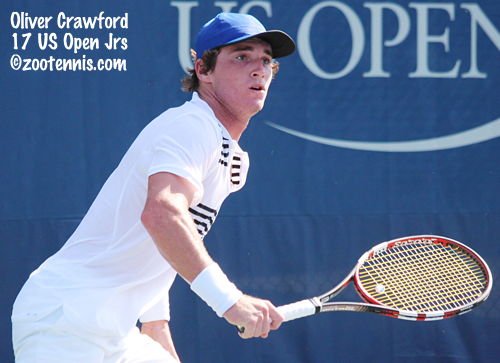 Crawford will face UCLA senior Maxime Cressy, who beat fellow French qualifier Valentin Vacherot(Texas A&M) 6-4, 6-4. The only other American to advance to the quarterfinals is unseeded Jordi Arconada, who will face former Texas A&M teammate Juan Carlos Aguilar of Bolivia, now a sophomore on the Aggie team, next. The Tennis Recruiting Network has begun its Countdown to Signing Day, and my contribution this week is the commitment to Vanderbilt of Ireland's Georgia Drummy. The 18-year-old left-hander, who has been at the Evert Tennis Academy for more than two years, is finishing high school this semester and joining the Commodores for the dual match season, which begins in January. Currently at a career-high of 35 in the ITF Junior Circuit rankings, Drummy has had the good fortune to receive input from Chris Evert while at the Academy, and Drummy told me what piece of advice resonated with her the most now that she had reached the top level of junior competition. The USTA Pro Circuit has only two $25,000 tournaments on this week's schedule, with the women in Florence South Carolina and the men in Harlingen Texas. 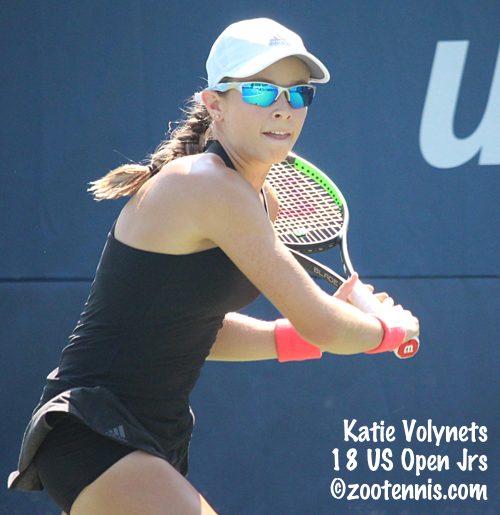 Sixteen-year-old Katie Volynets qualified for the Florence event on Tuesday, beating Mississippi's 2018 NCAA singles champion Arianne Hartono of the Netherlands 2-6, 7-6(3), 6-1 in the final round of qualifying. In today's first round, Volynets defeated former Florida star Anna Danilina of Kazakhstan 6-2, 6-3 and will face wild card Emina Bektas(Michigan) Thursday. Bektas advanced when top seed Kristie Ahn retired trailing 7-5, 2-3. Other American women advancing to the second round include No. 5 seed Kayla Day, Robin Anderson(UCLA), qualifiers Hanna Chang and Louisa Chirico, No. 8 seed Maria Mateas(Duke) and Anastasia Nefedova. Chirico defeated 16-year-old qualifier Hailey Baptiste 6-3, 4-6, 7-6(4), after Baptiste served for the match at 5-4 in the third. In Harlingen, qualifying was completed on Monday, with Jonathan Chang(Rice) and Georgia recruit Trent Bryde the only two Americans reaching the main draw via that route. Bryde won his first round match on Tuesday, beating fellow qualifier Jacob Eskeland of Norway 7-6(3), 6-3. Other Americans teens winning first round matches are Patrick Kypson(Texas A&M), who beat No. 8 seed Joao Pedro Sorgi of Brazil 6-3, 6-1, and two wild cards, Axel Nefve, the Notre Dame freshman, and Oliver Crawford, the Florida sophomore. Crawford will face No. 2 seed Ronnie Schneider(UNC) on Thursday. The sixth American advancing to the second round is Jordi Arconada, who beat No. 4 seed Sebastian Korda 6-3, 6-1. Arconada(Texas A&M) also defeated Korda last week in the Houston Futures' second round by a 6-1, 6-3 score. The $75,000+H ATP Challenger in Calgary Canada had five Americans in the main draw, but only one remains: Collin Altamirano. Altamirano(Virginia) defeated No. 7 seed Jay Clarke of Great Britain 7-5, 6-0 in the first round and will play Filip Peliwo of Canada later tonight for a place in the quarterfinals. Wake Forest junior and NCAA singles finalist Borna Gojo of Croatia defeated No. 3 seed Jason Jung(Michigan) of Taiwan 7-6(2), 6-2 to advance to the quarterfinals, where he'll meet the Altamirano-Peliwo winner. The ITA Cup concluded over the weekend in Rome Georgia, with eight singles champions from NAIA, Division II, Division III, and JUCO divisions advancing to next month's major, the Oracle ITA National Fall Championships in Surprise Arizona. The competition gives the winners an opportunity to play against the best players in Division I, and since the tournament moved outdoors and expanded to 64 draws there is no longer just one Small College Super Bowl Champion, as was the case in the past. The divisions' doubles winners are required to play off for the only spot reserved for a non-Division I team. Maria Genovese and Anna Brogan(Tyler JC) def. Zuza Maciejewska and Verena Schmid(Barry) 6-1, 7-5. The ITA's Fall Championships tournament page has a link to the list of all players who have qualified so far for the event, but it does not yet include the Division I regional champions. Although some Regionals have concluded, many begin later this week. See the ITA Regionals tournament page for schedules and sites. Below are the Regional results that I've been able to find; several schools have claimed their first Regional championships. The first round of the ITF Grade A Osaka Cup is complete, with two US boys and all four US girls into the round of 32. Robin Montgomery won on Monday; on Tuesday she was joined by No. 3 seed Gabby Price, Sasha Wood and qualifier Ayana Akli. Akli defeated ITF No. 60 and No. 5 seed Himari Sato of Japan 6-4, 6-3, for her first victory in a Grade A and just her second ITF Junior Circuit win. 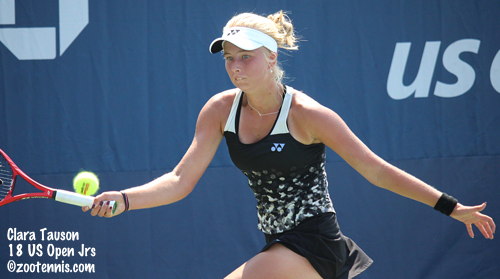 The only other ITF Junior tournament the 17-year-old Maryland recruit has played was August's Grade 1 in College Park, where she lost in the second round to eventual champion Katie Volynets. The US boys remaining are No. 12 seed Zane Khan, who won on Monday, and 16-year-old qualifier Muhammad Dossani, who won his first ITF Junior Circuit match above a Grade 4 with a 6-4 6-2 victory over qualifier Daisuke Inagawa of Japan. The ITF Grade A tournaments are coming in bunches now, with the Osaka Mayor's Cup in Japan underway now, just a week after the Youth Olympic Games. The ITF Grade A in Mexico has moved from Mexico City to Yucatan this year, and is scheduled for November 19-25, with the Orange Bowl ending the ITF Junior Circuit season December 3-9. As is usually the case with this Grade A, Americans are scarce. Gabby Price took a wild card into Osaka and is the No. 3 seed, with Robin Montgomery, Sasha Wood and qualifier Ayana Akli the US girls in the main draw. Montgomery, who turned 14 last month, has already won her first round match, her first win at a Grade A. Four US boys are also in the main draw, including No. 12 seed Zane Khan, who is through to the second round. Murphy Cassone, who played at the Pan American Closed last week in Charlotte, lost his first round match, while Trinity Grear and Muhammad Dossani earned their spots through qualifying. Grear drew top seed Valentin Royer of France. Clara Tauson of Denmark, who was initially scheduled to compete in the Youth Olympics but withdrew, is the top seed in the girls draw. Americans won both titles at the Pan American Closed last week, but Govind Nanda and Elli Mandlik were joined by nine other US juniors who collected winner's trophies over the weekend. 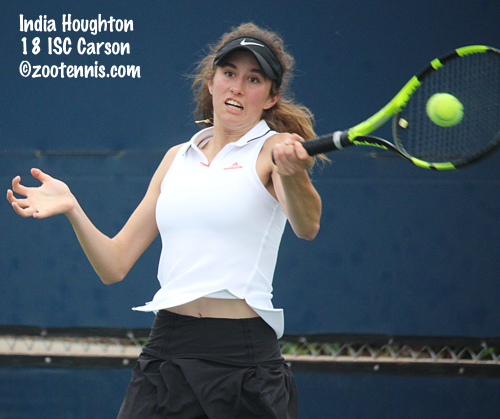 Sixteen-year-old India Houghton made her ITF Junior Circuit debut last week at the Grade 5 in Vancouver Canada and swept both titles. After winning two qualifying matches 6-0, 6-0, Houghton lost only five games in her next three wins, before needing three sets to beat the No. 7 seed in the semifinals. In the final, Houghton took on doubles partner and top seed Leena Bennetto of Canada and squeezed out a 6-2, 4-6, 7-6(2) victory. Bennetto and Houghton were not seeded in doubles but won the title with a 3-6, 6-1, 10-7 victory over No. 2 seeds Alexandra Nielsen and Chae Eun Yoo of Canada. Cash Hanzlik lost in the finals of both the boys singles and doubles. At the Grade 5 in the Dominican Republic, 17-year-old Randy Wilson, seeded No. 3, won his first ITF Junior circuit title with a 7-6(6), 6-2 win over No. 6 seed Joaquin Caballer of Spain. All six of Wilson's victories came in straight sets. Sisters Kiana and Maria Rizzolo won the girls doubles title, with the unseeded pair defeating top seeds Sofia Cabezas Dominguez of Venezuela and Laura Quezada Martinez of the Dominican Republic 3-6, 6-3, 11-9. The Grade 5 in Curacao produced American winners in three categories, with 15-year-old Alexandra Centra capturing her first ITF Junior Circuit title in the girls singles. Centra, the No. 3 seed, defeated unseeded Xintong Zhou of China 6-3, 6-3 in the final. Artemis Pados and Adele Fernandez LeCaroz of Puerto Rico won the girls doubles when No. 2 seeds Shirley Liang of Canada and Aleksa Marquez of Peru retired in the final. The boys doubles title went to No. 2 seeds Benjamin Kittay and Milledge Cossu, although they needed to win only one full match to claim the title. Their semifinal and final opponents both retired. Kittay, the No. 2 seed, reached the singles final, losing to No. 3 seed Derrick Chen of Great Britain 6-4, 6-3. Fifteen-year-old Michelle Tikhonko continued her winning streak in doubles at the Grade 5 in the Netherlands. After winning two titles with two different partners in Montenegro, Tikhonko made it three titles in three weeks, this time with Zuzanna Kubacha of Poland. The unseeded pair beat top seeds Zoe Billon of France and Melissa Boyden of the Netherlands 6-4, 7-6(2) in the championship match.